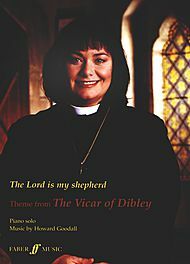 Howard’s setting of Psalm 23, the theme to the TV series The Vicar of Dibley, has proved to be an extremely popular piece of music in its own right. Howard’s intention in writing the theme had always been to write a piece of church music which could have a life of its own, beyond the series, and this has certainly been fulfilled in Psalm 23. “Anyone who thinks about the BBC programme The Vicar of Dibley, is likely to focus on one of two things: the dry wit and humour of Dawn French or the now instantly recognisable theme tune The Lord is my Shepherd by Howard Goodall. Almost a nationally known work, the arrangement is now available in a most accessible form, published as part of the Faber New Choral Works Series. I have no doubt that it will be a hit with choirs and their audiences alike, and it will provide a reasonably straightforward, light-hearted programme item, appropriate to a variety of occasions. Accompanied by piano or organ (string parts are also available from the publisher), the piece opens with a most lyrical, legato melody for solo soprano, repeated by tutti sopranos with simple yet effectiove harmonies for A, T and B, continuing in the warm, flowing style. A homophonic middle section, moving towards a more minor tonality, reflects the mood of the words ‘Yes, though I walk through the valley of the shadow of death, I will fear no evil’, and provides an effective contrast. A return to the original theme draws the work to a beautiful conclusion which, in the right circumstances, could provide a very spiritual moment. The piece makes only moderate demands on the singers in every respect, yet could have a long-lasting impact. It is certainly worth considering.” George Adamson, ‘Music Teacher’ magazine October 2000. Scored for: SSA or SATB chorus and full orchestra (2222 – 2000 – piano-strings), SSA or SATB chorus and strings, SSA chorus and piano. Availability: To Buy for SATB choir, To Buy for male voices or To Buy for piano. Contact hire@fabermusic.com for details about hiring orchestral parts.